We are one of the prominent suppliers of Flex Boards and designed using the advanced technology and premium quality material so as to meet the needs of the clients efficiently. 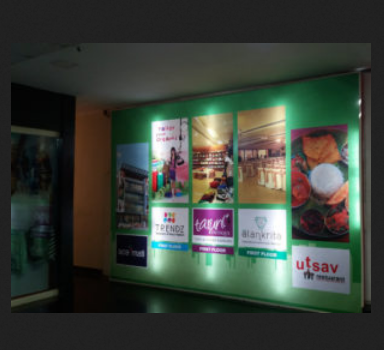 These fascinate the glance of the viewer as these come in extremely appealing and stylish designs.These boards are extensively used in highways, markets and busy roads for promoting various products or services. We design and maintain all kinds of Sign Boards and Name Boards for Business and Industrial Sectors and so on. As the sun is the only source of energy, Omkar Signs is the one and only designer of LED Sign Boards (Light Emitting Diode), Neon Boards, Directory Signage, Illuminated Signage, Pylon Signs etc. in the ‘East of Venice’, Alappuzha, a district in the state of Kerala. We design and maintain all kinds of Sign Boards and Name Boards for Business and Industrial Sectors and so on. Our designs aid customers in achieving their business aims and creating a distinctive position among the competitors.